Modern Brushless DC (BLDC) motor controllers that are housed in compact assemblies are ideal for integration into systems that require precision control and efficiency. This enabling technology fulfils the requirements of both simple and complex motor systems, while offering significant advantages and improving time to market. By Don Laskay, Data Device Corporation. The demand for electric motors is increasing at a rate of 5-6% annually, and is projected to rise through 2017 to a TAM (Total Available Market) of $14.4bn (USD) in the US alone. The growth rate is even higher in China and Asia, as these countries modernise and improve infrastructure. Within these markets, the expansion of mid-range horsepower motors outpaces that of smaller fractional horsepower types. Driving this demand are heating and cooling equipment markets, along with electric vehicles, which will provide the best growth opportunities. All systems, from industrial, avionic, military and space are seeing demand to improve efficiency and reduce weight. Along these lines, European markets have issued a directive to improve motor efficiency. Reductions in size and improvements in operating and ownership cost are also being driven in military and avionic markets worldwide. To achieve these goals, more reliable and efficient motors and control techniques must be considered. As this market continues to grow, the brushless DC motor is the most sensible choice based upon its reliability, efficiency and size. The BLDC motor provides clear advantage over other motor types in terms of optimising efficiency and size in demanding motor applications. BLDC motors do not have brushes and require less maintenance and system down time. Yet these motors require electronic controllers that range from simple to complex. The motors typically have efficiency of over 80%, and the controllers in the 95% range. Thus the enabling technology is the ever improving evolution of the BLDC motor controller. The most efficient controllers use Pulse Width Modulation (PWM) sampling to drive a motor from DC power. There are other power conditioning requirements that range from rectification of an AC signal to Electromagnetic Interference (EMI) filtering that is required in most applications. Robotics, Radar, Satellite Communications, Turrets. Each of these systems utilises specific motor control techniques that require tuning of one or more control loops - torque, speed and/or position. Precision and efficiency is determined on controlling voltage which sets the speed and current that controls the torque. A designer must consider the approaches of analog and digital motor control solutions. Analog motor controllers utilise resistors and capacitors for loop tuning. This typically requires knowledge of control loops and can be supported by data sheets, technical staff and formulas that aid in optimum component selection. Each loops’ design characteristics must be chosen carefully. DO254: Sets development and compliance standards for complex electronic hardware such as Processors, Field Programmable Gate Arrays (FPGAs), Digital Signal Processors (DSP), Programmable Logic Devices (PLD), and Application Specific Integrated Circuits (ASICs). The levels for this certification range from A: Flight critical to E: Non Flight critical. DO178B: Sets development and compliance standards for software used in avionic applications. Analog controllers are also commonly used in space applications to minimise the cost of radiation proof components such as processor, ASICs or FPGAs. Radiation test and characterisation is still required. Total Dose Testing predicts the life of the electronics and Single Event Testing predicts reaction of events such as solar flares. Manufacturers of these devices such as Data Device Corporation (DDC) design to meet common radiation requirements and perform testing to verify radiation tolerance performance. Additionally, hybrid microcircuits save space and weight. Digital motor controllers offer several performance and efficiency advantages that make them the controller selection of choice for many applications. The versatility of digital controllers has advanced as the evolution of DSP (Digital Signal Processing) and ASIC (Application-Specific Integrated Circuit) based processors now enable designers to create flexible products and improve time to market. The most versatile of these designs are based on DSP architectures which allows integration from simpler sensorless systems to complex multi-axis position control systems. The processing power of the DSP, along with associated Graphical User Interfaces (GUI), takes the complicated math out of the user’s design, requiring only basic knowledge and support to meet the expected motor system performance goals. The torque, speed and position loops are often calculated for the designer based upon motor and system parameter entry. Many controllers offer multiple control options. The embedded control and control logic in the DSP can contain complex mathematical calculations and algorithms that are required to gain the efficiencies of the field oriented (FOC) sinusoidal motor commutation technique. This technique delivers power to the motor by means of a sinusoidal (sine) waveform. The sinusoidal signal provides maximum voltage/speed in relation to the DC bus voltage and reduces noise by over 30% relative to a trapezoidal (trap) drive. The trap drive commutates the motor with a trapezoidal AC signal. The system losses in a sine drive are in the motor, while the trapezoidal drive’s losses are in the controller. Additionally, a sine wound motor will improve motor efficiencies as well. The torque ripple on a sinusoidal motor can be as low as 1%, while the ripple for a trapezoidal motor is over 13-14%. The sinusoidal system also reduces noise, which is essential to meeting EMI requirements. The trap drive system EMI signature and current ripple are higher due to the sharp edges and flatness of a trapezoidal signal. These signals are modulated by the PWM frequency in the motor controller. The processing power of DSPs also enables flexible motor control that can be utilised in a wide range of applications, from a sensorless motor system, such as a fan or pump, to a complex multi-axis design, such as those that are used in turrets and robotics. The speed controller uses internal sensing and algorithms that are required for speed regulation and also sets the control loop parameters for torque. Torque is proportional to current and speed is proportional to voltage. The bandwidth for the current/torque loop is generally greater than that of the speed loop. Torque controllers are used in applications that require holding torque and changes in direction, since these controllers maintain smooth transitions in torque through zero speed. This is known as a four quadrant controller. Controlling current/ torque to the motor will allow for precision speed control. Torque controllers utilise a position sensor on the motor to determine the position of the shaft, in order to energise the appropriate winding for precision control. This is most commonly a Hall Effect Device, but can alternatively be resolvers, encoders etc. A position controller utilises an interface with position sensors on the motor and at the load. The position loop is the outer control loop in this system. The speed and torque loops must be tuned as well. All three control loops must be tuned based on the motor and system parameters. Programmable motor control devices include a GUI that will aid and perform these calculations based upon the motor used and system requirements. As a system is implemented in the lab or field, system parameters often change and may require tuning to attain the desired performance. The GUI is the perfect tool to minimise the time impact of additional tuning. Another benefit of tunable controllers is that a motor can be swapped out and its replacement made operational with the simple change of parameters in a short time. Multiple motors can be used with the same controller. This will reduce the cost of ownership which is a key consideration for motor control systems. DSP-based solutions also allow for interfacing with host processor controlled systems that communicate on serial networks such as CAN, RS-485, RS-422 etc. Alternatively, speed and/or torque can be set by means of an analog voltage input when advanced features are not required. Also, on-board or system processors can coordinate 2-axis movement as required in satellite base stations, radars, turrets or robotic systems. 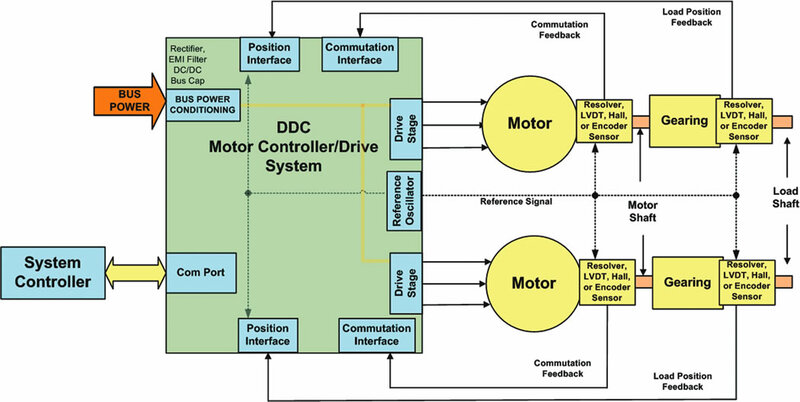 Motor control suppliers such as Data Device Corporation offer products that incorporate all control algorithms and sensor interfaces, as well as provide advanced protection, such as over temperature, over current, etc. This is true for both analog/trapezoidal drives and digital/sine drives. These devices have protection built into the hardware. The DSP based solution also can have soft limits set that interface with the motor control system with parameters set by the GUI. The control and power stage for these motor controllers are available in compact form, such as a hybrid or module, which can be integrated into larger systems. The controllers and supporting electronics typically are mounted on or near the motor. The motor system will also include a DC bus capacitor to reduce ripple and possibly EMI filters to reduce noise on the system bus. Consideration must also be given to dissipate motor energy Back Electro Motive Force (BEMF) that is generated when the motor shuts down. A large amount of mechanical energy is converted back into electrical energy, and this must be considered in the overall system design with implementation of a braking resistor or other method to store or dissipate this energy such as capacitor networks or batteries. For higher voltage systems, the bus capacitor should be of good quality and low equivalent series resistance (ESR) to reduce bus ripple. This capacitor should be located close to the controller to reduce resistance. Modern motor control products will continue to meet the growing demand for automation and motor control, as complex systems can now be supported with compact solutions. These designs provide all the processing power required for precise and efficient motor control, and can easily be integrated into box and system level solutions.